Eye relief is the distance between your eye and the ocular lens of the scope. When mounting your scope, the eye relief should allow you a comfortable, clear view at most scope zoom and focus settings. It should also allow clear viewing from the various shooting positions you anticipate. Keep in mind the recoil of the rifle, eye relief should be close enough to view properly through the scope, but also far enough away to avoid the scope recoiling into your brow when using proper shooting form. 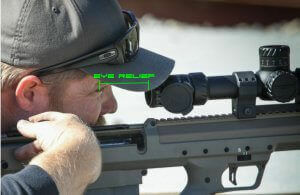 Eye relief is set when mounting the scope, moving the scope forward to the muzzle, or rear to the breach in its mounts may require adjusting your rings,or perhaps even require a different mounting solution. A good eye relief is set when a compromise considering most scenarios is reached. Keep in mind you may be wearing thicker/thinner clothing sometimes, or your rifle may someday shoot a heavier/lighter recoiling cartridge.